Deliver fruits to the marketplace with your truck! 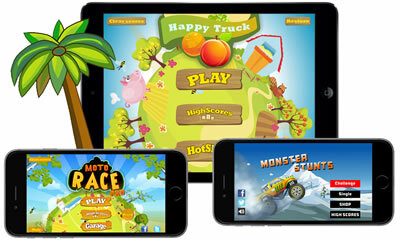 A stunt monster truck racing game. Drive the monster truck through the tracks as fast as you can to get rewards. A stunt bike racing game. Drive the bike through the tracks as fast as you can to get rewards. Get more rewards to earn more coins. Moto Race Pro v3.08 is out! Collect coins and don't crash, complete the levels as fast as possible to achieve maximum score points. Snow Off Road v2.66 released! A big challenge off-road racing game. Just racing to the destination within the limited time. Please be careful, don't crash your vehicles. Mad Truck 2 v2.35 is out! Drive the big mad truck on the mountain road to reach the destination in the limited time. There are many barriers(woods, stones, drums, scrap-car, zombies) on the road. Crazy with big challenge! Touch inside the green circle to spawn a new bullet to fire the poor piggy. Gravity Orange 2 v2.68 released! Help the orange to get all the stars, pass the orange through the window to go to the next level. A puzzle game. Make all tiles yellow color to complete each level. Tile Star 2 v1.55 released! Deliver goods to the marketplace with your truck. Collect coins to get advanced trucks, wheels and vip cards. A simple, but very fun to play game. Just have to drive the truck across rough terrain and make sure that your goods get to the destination safely. HeliInvasion 2! Survive waves of invading hostile helicopters! Survive waves of invading hostile helicopters! An endless bike driving game. It's different every time, and easy to play. Collect coins to get advanced bikes and vip cards. An endless running game. Tap the screen to jump and avoid all obstacles on the way. How far can you run?! Let's start an adventurous and exciting journey! Games for iOS, Android and Windows Phone. iPhone, iPad, & iPod touch are trademarks of Apple Inc. All other trademarks are the property of their respective owners.